Giving to support the Marquette University School of Dentistry. 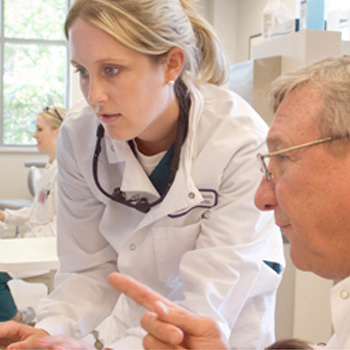 We are a patient- and student-centered dental school. You're in good hands in our clinic! How to become a patient. The Distinguished Alumnus in Dentistry Award recognizes a Marquette University School of Dentistry graduate who has shown extraordinary lifetime professional achievement in the areas of dental education, dental research or community service at a local, state, national or international level. This award is to honor a dentist who has exemplified the leadership and mentorship that reflects greatly on the dental profession and Marquette University School of Dentistry. The Outstanding Dental Service Award recognizes a Marquette University graduate for outstanding service to the community, the Dental School and/or its students and alumni in their local, state, national or international community. This award is to honor a dentist who has provided exceptional service to any or all of those constituencies and of a nature that reflects greatly on the dental profession and Marquette University School of Dentistry and its mission. This award honors an alumnus/a under the age of 40 who has demonstrated significant professional achievement, personal responsibility, technical excellence and/or service to the University or community. Have you ever thought about teaching on the Part-Time Faculty? Are you passionate about dentistry? Do you enjoy sharing your experiences and knowledge? Do you want to be part of the future of dentistry here in Wisconsin? Come and hear more about the opportunity to teach on a part-time basis. Dr. Lisa Koenig delivered the H. Cline Fixott Sr. Memorial Oration at the 69th Annual Session of the American Academy of Oral and Maxillofacial Radiology on Friday, September 14th in San Antonio, TX. The honor and invitation to speak is extended to a member of the Academy that has significantly contributed to the feild of OMFR and also recognizes the founding father of the Academy, Dr. Henry Cline Fixott Sr.
Dr. Mohamed Ibrahim has authored the chapter "Biocompatibility of Dental Biomaterials" in the recently published book "Biomaterials for Oral and Dental Tissue Engineering." Dr. Paul Andrews, Dent '74, has pledged a gift of $5,000,000 from his estate for scholarships at MUSoD. The focus of this scholarship fund will be students who are veterans, or if possible a student(s) with tremendous financial need. Check out the Winter 2019 issue of Dental Images, our annual magazine. Every step you take in our four-year program will be guided by faculty and practicing professionals who uphold Marquette's vision.